We’re joined by the much-loved, fast-talking father and son team Hans and Raffa. Some encounters feel like they were meant to be. 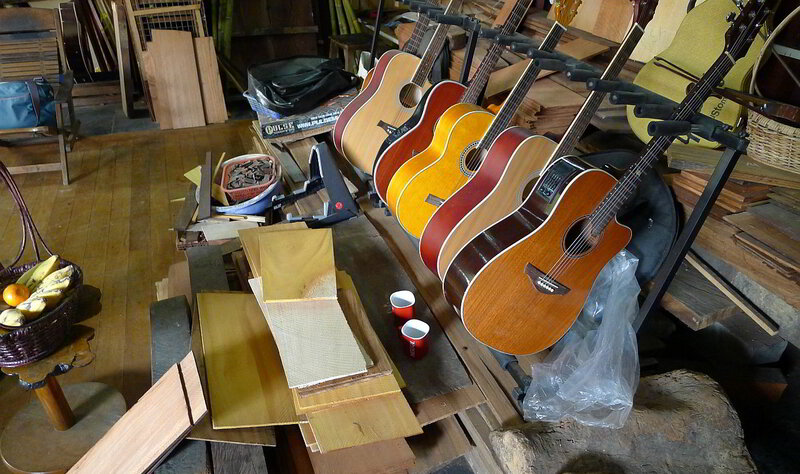 EG owns a small guitar making workshop near Kandawgyi lake in Yangon. The soft glow of a collection of finished guitars drew us into the shop- and EG’s fascinating story kept us there. A sailor out of necessity for two decades, his ships hauled metal parts between Amsterdam, Monrovia, Singapore and Kiel. EG’s life was dangerous and hard. Music, he recounts, was my joy and comfort, my lifesaver. With almost desperate determination, EG looked for a way to turn his life around, a way to make a living with music. He decided to invest 27 hard-earned dollars in a guitar-making book by Robert Benedetto and over 3 years built his first guitar, piece by piece, bit by bit. Whenever he’d saved a few dollars, he’d order a new part for his guitar. Carefully, painstakingly he assembled the instrument he calls “my teacher”. EG is 60 now, a seasoned guitar maker, a gentle custodian of our planet. No tree dies for EG’s guitars. The wood for them is harvested only from fallen trees. Sadly, storm Nargis supplied wood for endless guitars- But could there be greater joy and meaning EG says, than to make something beautiful out of death and destruction? We checked out the woods harvested from those trees, which sounds sweet, which bright, which big. We admired the shells that go into the making of the inlay. And we (say Raffa) ordered a custom-made sweet- sounding, (traveling) guitar! An EG Tiny, Cedar wood front. Update with picture to follow, when the Tiny is finished. 8 Responses to A Match for Myanmar? A delightful story, delightfully told. I particularly liked the ‘soft glow’ that drew you in to the shop. I will be spending 3 weeks in Myanmar next year and in Yangon I will be staying near Kandawgyi Lake. Is there any chance you could give an address or directions to EG’s shop? I would love to visit. Also, on the invoice it shows ‘Delivery $135.00’. Delivery to where? and did EG arrange that? I’ll pm you the whereabouts of the shop. “23d Feb Delivery “- just meant the guitar would be finished by then. (We picked it up on leaving Burma.) International deliveries are possible but presumably very expensive. The guitar incl. 2 custom abalone inlays (Rafa got to pick out the shell) and soft sleeve cost $135.- And a very nice guitar it is! I have been trying to find the address of this luthier (Ko Cho). May I know his whereabouts? I have been trying to locate him since he last changed his address. 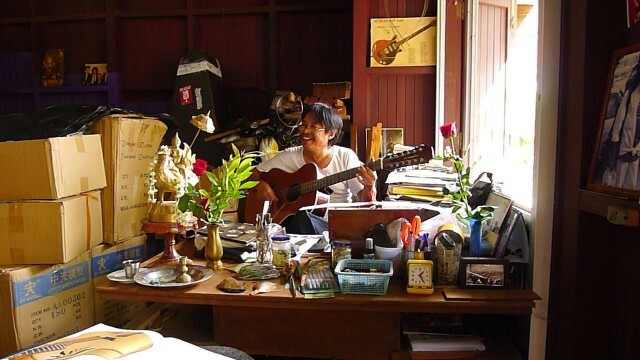 I would love to purchase another of his guitar when I am back home in Myanmar. Am updating my post with contact data. Unfortunately EG’s shop has moved from Kandawgyi Gardens and the new locale isn’t open yet, it’ll be somewhere near Sule Pagoda. I was able to call him. Garden offices across from where the shop used to be (near the huge golden ship) had a phone number. Not sure if the one on the card works. I am working with refugees to play and repair guitars in a refugee camp on the Thai Myanmar border. 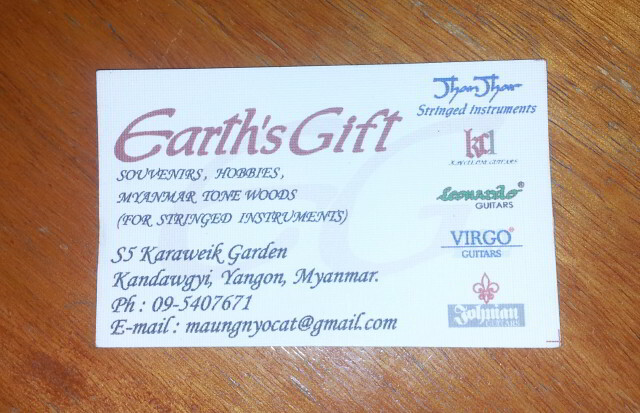 Id love to get in touch with guitar makers in Burma/ Myanmar; can you help with contact details? 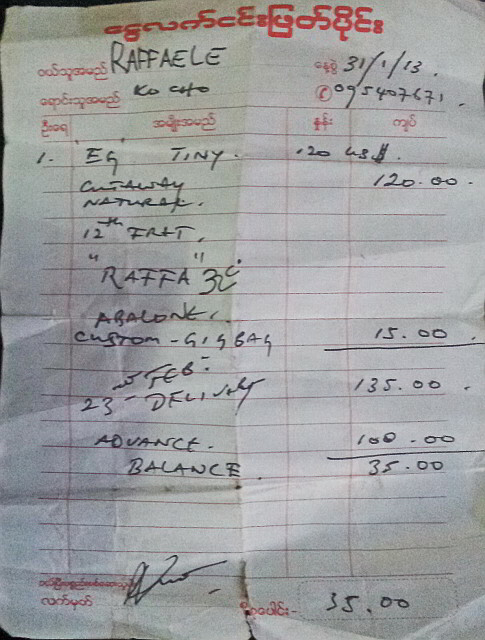 Dear sirs, I would like to learn more about the guitar industry in Myanmar, especially for the guitar manufacturers. Could you kindly refer some for me? Thank you in advance. Hi, what I know is in the post. 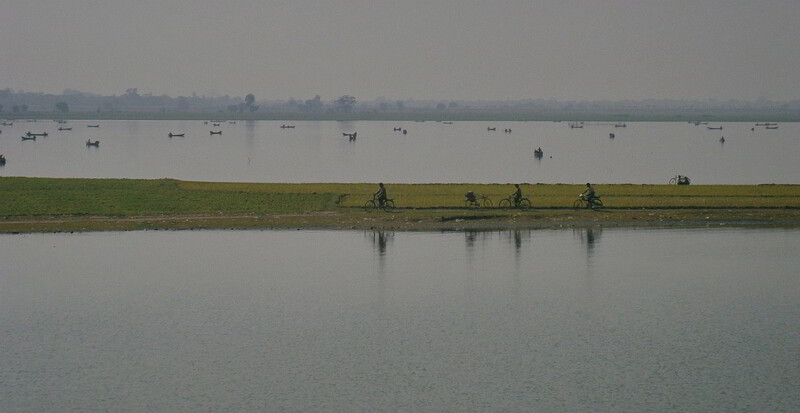 Try google or join some Myanmar Forums or facebook groups.